Melissa Scott and Amy Griswold's Death by Silver is billed as a "fantasy/mystery." It is, perhaps, more heavily weighted to the latter than to the former. The setting is a Victorian England in which magic works and is in fact publicly known and accepted; the magic itself plays as window-dressing for the actual story, a tightly written murder mystery. Newly established metaphysician Ned Mathey is approached by Edgar Nevett, the father of a former bullying schoolmate, to lift a possible curse on the family silver. Mathey discovers nothing amiss and declares the silver clean—and Edgar Nevett is killed by an enchanted silver candlestick a day later. But Mathey is a curse-breaking magic-wielder, not a detective, and so he brings another old school friend, Julian Lynes, into the case. Together, they race to uncover secrets, solve the murder, and confront their own past and present relationships. To say that, initially at least, Mathey and Lynes remind the reader of Watson and Holmes is a bit of an understatement. I have no doubt the authors intended this; like Jess Faraday's The Affair of the Porcelain Dog (2011), Death by Silver gives readers the chance to imagine a physical/romantic relationship between Holmes and Watson without the Doyle purists shouting about "canon." 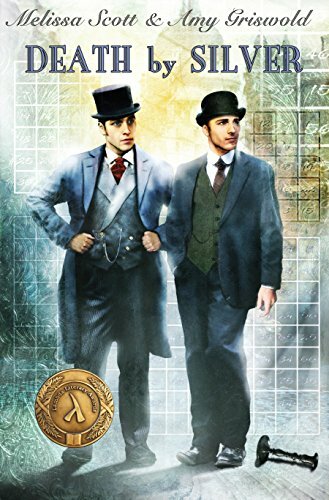 Lethe Press also published a more direct Holmes-Watson pairing this spring, My Dear Watson by L.A. Fields, and last year published A Study in Lavendar: Queering Sherlock Holmes , an anthology edited by Joseph R.G. DeMarco; it's clear that publisher Steve Berman understands the continued draw of pairing Holmes and Watson romantically. In Silver , Lynes is the Holmes-like one and Mathey the Watson stand-in. We meet Mathey first and understand that he's in a bit of financial distress: being the newest shingle on the metaphysician block, or Commons. He's a solid man, ready to help out his colleagues (two of whom have magically set fire to a dustbin during an experiment) and his customers (no matter how frustrating they may be). Money is a concern, but it's clear that Mathey does have his limits on how far he'll stoop just to make a buck. He's a committed professional, not a con artist. The fact that he's a credentialed doctor, a stand-up guy, and friends with a detective is largely where the similarity to Watson ends. The book is not written in first person from Mathey's perspective, which gives us another remove from Watson. Lynes's similarities to Holmes are far more obvious: he's a detective, lives in a bachelor apartment suite under the auspices of a stern female housekeeper, scans the papers every morning looking for a case that might excite his otherwise boring days, and has a drug habit. He also, like the Great Detective and those who have followed in his footsteps, pays attention to the physical details that others might miss, as in this exchange in which Lynes shows off his deduction that Mathey is on his way to a job. "You've just been walking in the Commons garden," Julian said, bending swiftly to pluck an ambitious tendril from Ned's trouser leg. It twitched in Julian's fingers, a sign that it hadn't long been detached from the parent vine. . . . "You came here from the Commons, but you didn't send round first to see if I was free. I'm guessing because you couldn't wait; you're on your way to an appointment, but you wanted to stop by to ask me . . . what?" "I might have been overcome by carnal desire and come round to try my luck," Ned said. Okay, so the end of that conversation isn't something you'd read in Conan Doyle. But it does lead into a discussion of one of my favorite aspects of this novel: the slow, awkward build of a romance between Mathey and Lynes, from schoolboy experimentation (mentioned, but not detailed, in flashbacks) through an awkward adult "friends with benefits" arrangement that both are unwilling to admit they'd like to take to a more committed level. The advantage to this not being a first-person narrative is that we get to see into both men's minds and understand where their reluctance in romance comes from: they are Victorian gentlemen after all and though the novel's world has been sufficiently altered to allow magic, it still frowns on homosexual relationships. The authors chose the Victorian time-period for more than just the snappy clothes and witty repartee. Mathey and Lynes are equals in every way, although their talents lie in different directions. This not only makes them believable as lovers, it also makes them perfectly compatible crime-solvers. Flashbacks to the beginning of their friendship and relationship in their school days also establish why Ned and especially Julian have no love to lose for the Nevett brothers, feelings which threaten to complicate the investigation. The mystery itself is on the front burner, superseding the romance or the magic. If Mathey cleansed the Nevett silver, as we see him do, then how did an enchanted candlestick kill the head of household, and why was the man murdered? The list of suspects more befits the classic British cozy murder mystery of Agatha Christie than what would be found in a typical Holmes story: the dead man's wife, three adult sons, daughter-in-law, servants, and even the family pastor, who does good works with the downtrodden, fall under suspicion. The authors do a wonderful job of spinning out the threads, making family members likable and then unlikable by their words and actions, which is key to keeping the reader guessing as to who the murderer is. At a certain point, of course, the murderer's identity becomes apparent to the reader as well as the investigators, and then we are back in Holmesian territory as Mathey and Lynes play a dangerous cat-and-mouse game with the murderer before turning their information over to the police. The authors pull this endgame off with a rising tension that works very well even though the ultimate outcome is pretty clear. In addition to Mathey, Lynes, and their housekeepers, the authors also introduce two other supporting characters who will clearly be important if the book goes to series. First, Mathey's office clerk, Miss Cordelia Frost, has talents and a sharp mind of her own; if she is sidelined a bit (providing valuable information that she procures off-screen, rather than in scenes of her own), it is probably because the number of sub-plots is already overwhelming and another point-of-view might have slowed the book down interminably. I'm convinced in future novels Miss Frost will get more attention. And then there is Inspector Hatton of Scotland Yard, an officer who respects Mathey's work ethic and methodology and comes to like Lynes as well; the polite and respectful interplay of our adventuring duo with the police is another nice change from the standard Great Detective mode. Finally, we must talk about the magic system. It's a great bit of worldbuilding, but once introduced does fade into the background until the case nears its end. Magic is a fact of life in this version of Victorian England, and none of the characters are surprised by it; it informs everything from the way food is prepared and preserved (sugar bowls magicked so that lids stay on even when the tea set is knocked over) to whether the front gate will admit a visitor. There are credentialed practitioners like Mathey, back-alley self-taught types, sham artists, and a thriving sub-culture for women practitioners (again, it being Victorian England, there are certain professions women just don't go into). If anything, magic is so much an accepted part of the characters' lives that it doesn't really need explaining to anyone, and that is my one disappointment with the book. I have a vague picture of how it all works, and it does play a key role in several exciting scenes, but I can't claim to really understand the system. I'd have liked a bit of a clearer description of how the magic works, but it’s hard to avoid info-dumping exposition when every character in the book accepts the magic as a fact of life. However, I'm confident that if the series continues, the authors will find a way to give readers that deeper explanation. Despite my confusion about the magic system, I walked away from the book with a contented smile. While detailed world-building is a hallmark of good gaslight fantasy, Death By Silver 's strong points of fair-play mystery and strongly developed characters are what will bring this reader back for a second installment. Anthony R. Cardno's reviews have also appeared in Icarus and Chelsea Station . His short fiction can be found upcoming in Beyond the Sun (Fairwood Press) and Oomph (Crossed Genres). He interviews creative types at www.anthonycardno.com and can be found on Twitter as @talekyn.